A few weeks ago my mom gave me a package of wooden letters. I put them away, not knowing exactly what to do with them. When my husband came home from a long trip, I knew it was time to break them out. 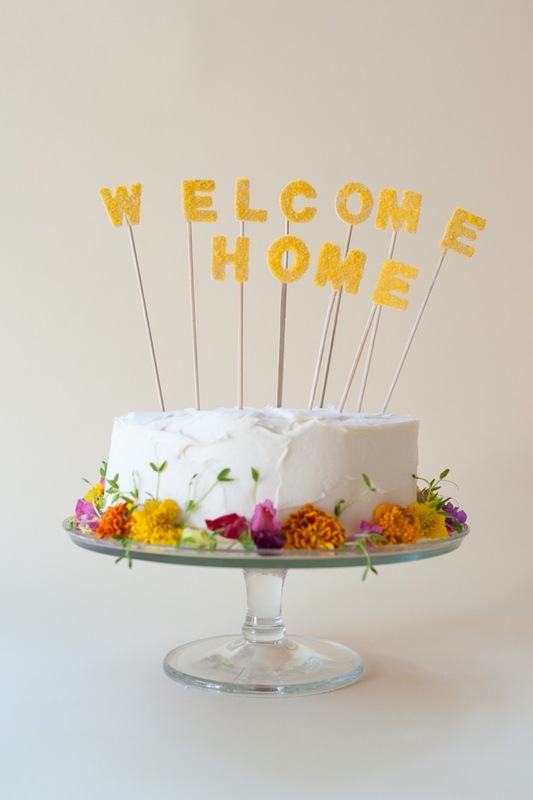 This is the prettiest and easiest cake topper I’ve ever made. And, you can write any message under the sun with these letters, and use any color sugar you can find – there are so many pretty hues out there. 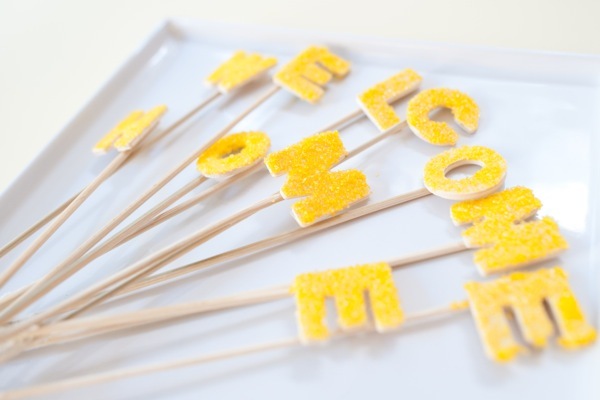 Materials: wooden letters, glue, paintbrush, wooden skewers, edible sanding sugar. 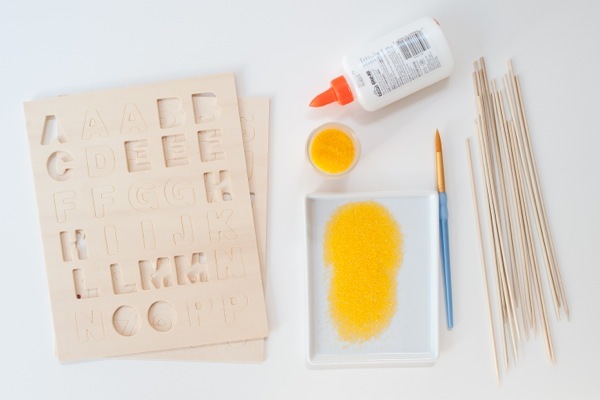 Step 1: Pop out letters, turn over and glue a skewer to each letter. Let dry. Step 2: Mix approx. 1 Tbls. glue with 1/2 tsp water. Mix and paint onto a letter. Step 3: Place letter with glue on it face down in the sanding sugar. Use a little pressure to make sure the surface is fully coated. Repeat with all letters. Step 4: Let dry again, stick in cake. Done! Enjoy! Such a lovely gesture. I love celebrating the everyday like this. So lovely! i love cake toppers, I have to try these. Love the wooden letters, what a great find. 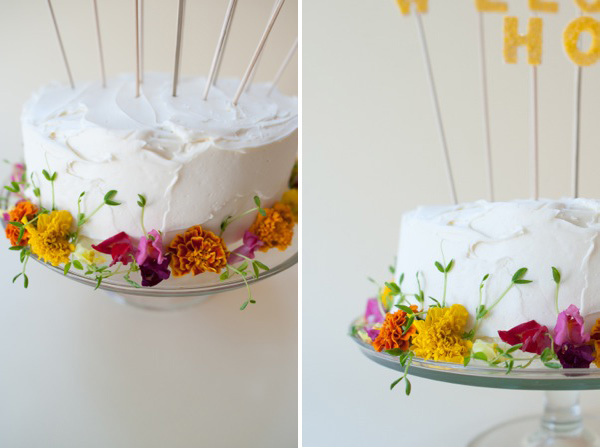 I love the flowers as decoration for the cake. They make a perfect team with the glittery sugary letters! Great post. Love that cake with flowers and message. These are adorable. It would be fun to use a flour & water paste to stick the sugar on to make the letters nibbleable/lickable! This is such a purposeful, reusable project. Instead of wasting candles, a wash and reuse “sign” is brilliant! What a cute way to add even more pizzaz to a cake! Such a sweet idea for a husband or wife coming home again. What they really want is a nice family dinner. This would help make it even more special. Loving those flowers. What a great surprise to come home to! 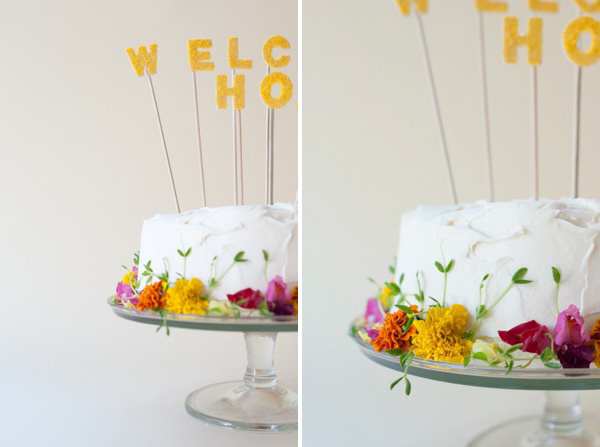 What a cute cake topper, as well as a beautiful cake! Yum!! Such a nice occasion to celebrate! What an amazing idea, will need to try this out sometime. Love this. Such a cute idea!!! wow ! it’s amazing, thanks for such wonderful idea. Are those alfalfa sprouts mixed in with the flowers?! Genius, it looks great! What an ingenious way to welcome somebody home. That’s awesome!